Yes it's Valentine's Day once again- and the Nintendo Download service is all atwitter with that warm, gushy, feeling of Pucca and Treasure Hunter X. Those are the pair of headline titles for this week anyway, whether or not you feel they match up with Valentine's Day or not is entirely up to you. Not even the Wii™ Shop Channel and Nintendo DSi™ Shop are immune to the spellbinding forces of Valentine’s Day. You’ll find unlikely hints of romance creeping into the WiiWare™ service with Pucca’s kisses game, featuring a sweet heroine who’s smitten with a wily ninja. 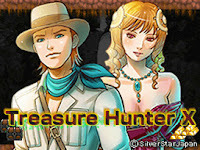 Love is also in the air on the Nintendo DSiWare™ service as the hero of Treasure Hunter X pursues precious artifacts in hopes of winning a woman’s heart. Wii owners with a fear of commitment will be pleased to find a pair of dreamy diversions among this week’s downloadable offerings: Demo versions of chick chick BOOM and Chronos Twins DX are now available for zero Wii Points™. Description: Pucca has one great dream in her life: to kiss the sweet and tender Garu, a little ninja who hasn’t the slightest desire to do so. But Pucca is a young lady who is as much in love as she is stubborn in her pursuit of Garu – she is truly determined to cover him with kisses. Pucca’s kisses game is a fun-filled and interactive cartoon that will enable you to pause the episode whenever Pucca faces an obstacle or is in danger. Help her overcome each challenge before heading out once again in pursuit of her beloved Garu. Description: Five chicks on your side, five chicks on the other … BOOM! In chick chick BOOM, you can throw pianos, pink elephants and sumo chicks or summon slimy giant jellyfish and UFOs. Draw lines in the arena to defend against your opponent’s attacks. The real skill lies in your use of ink, creativity and timing. Extra help is provided by a corncob and a piñata. Play on your own or with friends, as a team or against each other. To keep things interesting, there are various game modes and different arenas, each with its own special attack. Description: Enter the original world of Chronos Twins DX to experience a fantastic adventure filled with innovative ideas. Thanks to its Dual Gameplay game system, you’ll be able to control Nec in two temporal scenarios at the same time. Chronos Twins DX mixes action, platforms, adventure and puzzles that will challenge your intelligence and skill. Description: The risk is great and the rewards are even greater. Many untouched caverns still exist in the world, just waiting for someone brave enough to explore them. Within them lie vast troves of treasure and rare artifacts. As Tyrol the treasure hunter, you must collect treasures and escape from the caverns. Be warned: There are creatures lurking in the depths of the caverns, and the element of nature is against you. Use your pickaxe wisely so you don’t get trapped and lost forever within the darkness of the caverns. Can Tyrol collect enough treasure in order to win the heart of the woman he loves? Description: Oscar is back with more zany, nonstop action in seven exciting new worlds: All Star Sports World, World of Toys, Blox World, Water World, Old Time Toys, Travel Town and Mech World. Your mission is to swim, fly and run through these worlds collecting baby Oscars that have been scattered throughout the levels. You’re armed with your secret weapon: a yo-yo that you can use to swing from platform to platform and zap nasty enemies in some of the craziest levels you’ll ever play. Description: Guide Tik-Ling the panda through caves, forests, mountains and deserts on the way to her home, the bamboo forest. The concept is simple: Collect all of the magical lanterns in each level to unlock a magic portal to the next level. Getting to the lanterns without getting stuck, however, isn’t so simple. Dig, drill and blast your way through ice and rock in this epic puzzle adventure. Enjoy 150 challenging puzzle-platform levels. Accumulate new abilities and tools as you progress through the game.